It’s time for Friday Fictioneers where writers are challenged to write a 100-word story based on a photo prompt. All are welcome to participate. Join in! They checked trees and rocks validating they had arrived at their swimming hole. Desi’s name etched into the rock confirmed it. “Where’s the water?” said Desi. Desi skidded a rock and it bounced off the cracked earth. “Don’t worry, it’s just a cycle. Next year, we’ll be flooded,” said Arnold. She climbed on top of a tire in the middle of the lake as a lizard scurried beneath. He put his arm around her and she shrugged it off. “Wi-Fi it is,” he said. Thanks to Rochelle Wisoff-Fields for hosting every week. She’s so amazing and I appreciate all her hard work. Thank you to Madison Woods for supplying the photo. You can find more stories from this week’s prompt here. Folsom Lake at 17% capacity last year. There’s some tires for you. I hope California gets some rain soon. It’s a shame we can’t send it some of ours. Thank goodness, but I think they’ll miss their swimming hole. I wish, Ali! Wow, and such incredible things can be found stuck in the mud, revealed as the water drops! Right! In the lake where I live, whole ruins showed up from the first settlers. It’s pretty fascinating. Who knew what was under the lake? A whole city. It is amazing what lies underneath the water…beneath. Great take on the prompt, Amy. I would be devastated if my swimming hole had dried up. I love WiFi but it’s no substitute for a good swim. Praying for rain to come your way. Good story. Rochelle, I thought you’d feel this way about a swimming hole. The consequences of a drought go beyond the farmers. Poor kids. Thanks so much, Rochelle. Aww, thanks Trent. We would gladly take them all! There needs to be a happy medium – you were roasting and dry all winter and we were frozen and snow bound. Can’t the weather-gods balance it out? I would have been happy to spare 5 or 6 feet of snow. I’m sure I wouldn’t have missed them! Oh, I wish we could balance it out. We need to get a call in to Mother Nature! Fix this, please. Oh, it’s going to be a hot one this summer, Trent. I can feel it already. Actually, just over night it turned warm here. Up in NH we’ve had a few days in the 80s and I think we’re going to hit the 90s this weekend. I’m on Cape Cod and it’s 60s/70s – perfect for me. I’m not sure if this week of warm weather is a sign of a hot summer or just a fluke. I thought this was inspired by your drought problem. It’s even a big story all the way out here. Today, a report said that Beverly Hills wastes more water than any other community in the State and the residents there show no willingness whatsoever in conservation. Whey must the wealthy constantly reaffirm every negative stereotype I have about them? The drought problem is definitely hanging over us, especially going into the summer months. I heard that about Newport Beach, too. I think they’re one of the worst for over consumption of water. I guess they will be getting some pretty hefty fines. We’ll see if that makes any difference to them, Mark! Money usually speaks to the wealthy. That’s a language they understand. I hope so. Our biggest water users are the farmers which I think use about 80%! So, it’s a very complex problem. But every drop counts. People see green lawns and they think all is well. That’s not the case. Great story! 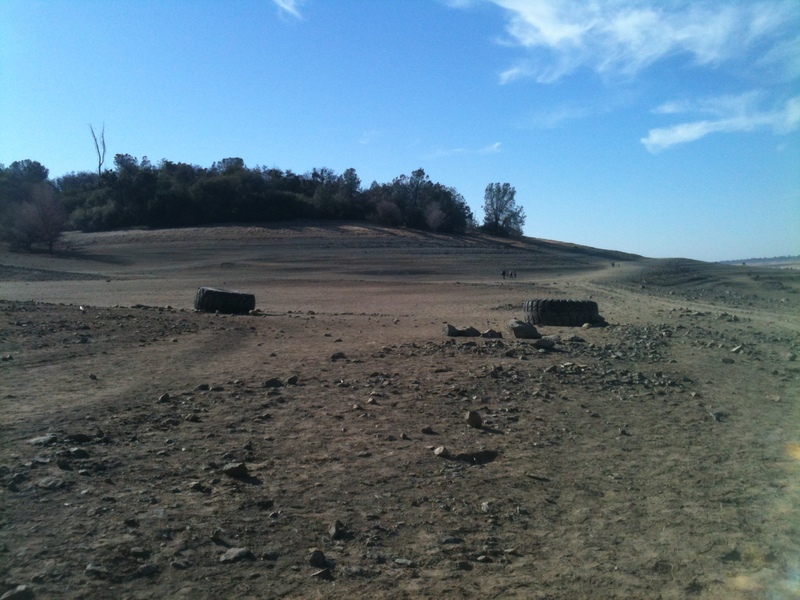 You’ve mentioned the drought a number of times to me – it’s interesting how the prompt made that connection for you.That’s a sad photo of Folsom Lake and must have been a strange experience. Thank, Kelly. I hope this story highlights a different point of view than usual when I’ve talked about the drought. Here it’s from two kids, of course. My connection to this prompt was simply water. When I looked at it I simply thought that container is empty. I’m sure there will be lots of different takes with this one! It was a surreal experience at Folsom Lake that day. I’ll never forget it. Yes, that must have been a really strange experience! I hope it doesn’t stay that way and fills with water again soon! It does have more water now, Kelly. Whew! It could use a lot more still. I’m glad you said that, Bjorn. I think it’s wistful, but it’s also very sad. These kids might not even know what they’ve lost, not until they can’t get it back…and that’s chilling. Thank you. Great story, Amy. I, too, wish I could send you some rain. It’s been raining here in usually arid and sunny Colorado for over a week, now! Nice take on the prompt Amy. Well done. The drought in California is really sad. 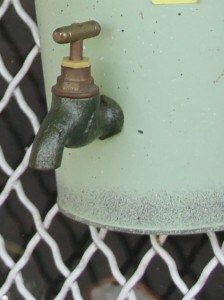 I try to be mindful of it when I run water and try not take my abundant resources for granted. Well, I could do far better than I do. Far better. Me too! But every bit counts and every day is a new day. There’s a small lake down the street from where I grew up. The neighborhood gang spent hours down there – no swimming but lots of catfish and bull frogs and dragonflies. My world wouldn’t be the same if I hadn’t had the chance to play there. May it stay full for others to enjoy. Great story. Oh, that’s great you had that experience growing up. I can imagine what a little swimming hole would mean to kids, especially one with bull frogs and dragonflies. Even if it wasn’t something you could swim in, it was a chance to enjoy nature and share it with others. What a great little treasure you had! I hope it’s still there. If the big lakes are drying up, what’s happening to the little swimming holes? It is still there, now full of cattails and red-winged black birds, ducks, geese and the occasional pelican or swan. My parents still live in the house – we get to visit about once a year. Very special, it is. That’s wonderful, Alicia. Thanks for sharing that with me. I remember when you went to that dried up lake! Creepy. Like the Salton Sea without salt. Your Friday Fiction devotion is always impressive Amy. I agree with Bjorn’s comment. Probably a lot of today’s youth would rather surf the internet than surf water. Our swimming place was called Bluff Hole on a tiny creek in the country. It’s still there and my son takes his children there to play and swim. Oh, that’s just sad isn’t it, especially when you put it that way…surfing water or surfing the Internet. That’s great the place is still there! Bluff Hole, I love that name. That belongs in a book. 🙂 That must be gratifying that the next generation is enjoying the spot. Thanks, Russell. I know you know then. Hopefully, we’ll get past it. Are you saying we’ll have wi-fi but no water? Very sobering for those of us who are still wasting water all throughout the planet. Good job, Amy. I was going to add coffee….but see, without water, no coffee! Everyone knows you need coffee with Wi-Fi. Thanks, Perry. My cousin lives i California also and writes of the drought. We d indeed take our most precious resource for granted. Yes we do, Dawn. It’s just not going away quietly into the night. I hope it turns around soon. Thank you. I think it is good that writers like you continue to bring awareness. You’re so sweet. Thank you, Dawn. I’m not surprised your time at Lake Folsom influenced take on the story. Of course many of us know that there is so much today (such as Wi-Fi) that takes kids away from just playing outside. I hope I don’t sound like a broken record. I just thought of a dried lake and was just reading articles related to that. So, it was on my mind and Folsom Lake I will never forget. So true about Wi-Fi. It’s a constant struggle to have balance. It’s dry in Nevada too. Most of Tahoe’s boat launches are closed because the water is so low. I liked the lizard on the tire swing; that phrase confirmed the dryness. I’m sure Nevada is feeling very dry, too. There’s a lizard here where there should be fish. Thanks, Tracey. Sad. I know the heartbreak just here in Florida with the drought we faced a few years back, the worries it brought on, and the lakes which dried up – some of which still haven’t made it back last I saw them. Great irony with the image of WI-FI distracting “us” from real world concerns. I feel that a lot of people here are in denial as if a few rain storms will bring about a full recovery. That’s just not going to happen. We need a lot of wet weather. I hope it comes. In the meantime, yeah we need to not take it for granted. Randy, I’m surrounded by green lawns and I’m sure everyone is using their Wi-Fi, too. Thanks so much. Equal parts scary and sad, Amy. Oh. Smart, too, on your part. Let’s hope it doesn’t happen. Kids need their swimming holes. Thanks, Mark. I think so, too, Suzanne. I got to see a dried lake up close about a year ago. Whole cities reappeared from the past, at least the ruins from them. It was pretty fascinating, but also a bit eerie. Whole ecosystems were destroyed, definitely. I hope things start improving quick. Thanks for your thoughtful comments. I’ve heard some pretty dire things about the drought forecast for California, especially this year. It’s pretty scary stuff. If I could, I’d give you some of the rain we’ve been getting lately. That’s quite all right, David. I appreciate you getting a read in. It could be a pretty bad summer. Storm coming tomorrow. I hope it’s a real wet one! I wish you could, too. Can’t you somehow? Oh, pretty please. So far we haven’t gotten too much, as in flooding, but I’m sure the farmers are happy about it here. This is about monsoon season in a lot of the world, so it’d be nice if they could send a couple to California. You’d love a few monsoons there. We sure would. Send ’em over!